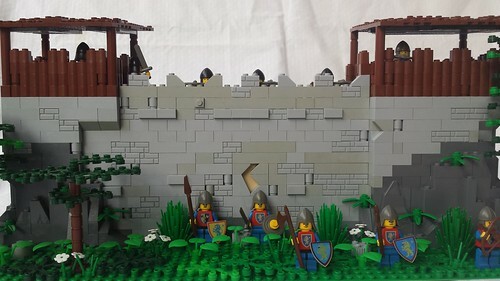 Here is my first semi-serious attempt to a castle wall and a tribute to my childhood castle era. Crusaders are assaulting a Falcons bastion. Inspired by many of your awesome medieval MOCs that have hopefully made me a better builder than i was before (although i must seriously improve my landscaping). C&C always welcome of course! Looks great, especially considering this is your first attempt at a castle! I really like the wooden sections, and tough some more green plates could be used on the backside, you do not have that on the front! Very nice build. I think, for the medieval times, there is missing some fire :) Like torches on the wall or a small fire on the back of the wall for the tough soldiers so they can warm up after the fight and during the night! Looks good. One main detail that annoys me here is the yellow showing through the crack in the wall. If you plan ahead for where you want to have the cracks in the wall, it allows you to have that part of the internal structure of the wall a better colour. I have to agree upon that. Thanks everybody for your constructed criticism! Banners and fire is indeed something that would make the castle well... look cooler! Regarding the tan interior of the cracked wall, this was made on purpose, as i wanted to see the dirt used between the rockwork. I had an inner strife about the dirt's color so i left it tan (as is the case in my island forts) On second thought, reddish brown would look better (?) but i already used this color for the wooden sections. So any ideas? You can mix some colors for the inner stone part (the tan) and make it look like some randomly composed stones. Nice idea! I will build something similar in the future and check how it will look like! Nice! Is that a mix between old gray and new gray in the wall? If so, I like it. Yep, new and old gray mixed together. I wonder if you let light gray bricks out in the sun for days, will they become old gray? Good start for first attemp my friend! This is truly brilliant stuff. Fantastic sense of detail! I really love the dimension of the trees and the rusty, torn-down look of the wall. Great job! Nice job, looks very cool to me just as it is.